Looking at the design, the corners of this tub are pretty deep, you can place many bathroom products such as your shampoo, conditioner, soap, or bath gel. The depth is satisfying for most people, it offers a great platform to fully soak their body. The slip-resistant surface keeps you safe from accidental slip. Cambridge Bathtub features gently curved and embracing bathing well, you can see the apron front features a single, linear contour. To give user optimum comfort, this bathtub has been designed with a lumbar supportive contour and a beveled headrest, stylish in design and enjoyable to use. 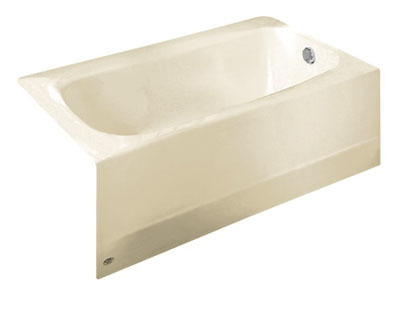 One more thing, this bathtub complies with ADA (Americans with Disabilities Act) where a bath seat can be installed at the drain end of the tub. Where to buy American Standard 2461.002.020 Cambridge 5-Feet Bath Tub? This entry was posted in Bathtubs by Bathroom Fixtures Reviews. Bookmark the permalink.